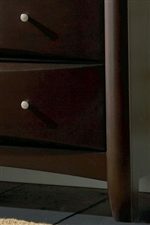 Shown in Room Setting with Nightstand, Dresser, and Mirror. Bed Shown May Not Represent Size Indicated. This beautiful contemporary platform bed will be a bold centerpiece in your master bedroom. The elegant high headboard has a gentle curve, with a rich dark faux leather upholstered panel for a luxurious touch. Sleek side rails and tapered feet complete this stunning modern look. 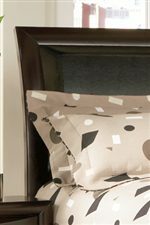 This bed is available in a deep Cappuccino finish to complement your decor, and comes in queen, king, and California king sizes to fit your space. The Phoenix Contemporary California King Platform Bed with Vinyl Panel Headboard by Coaster at Michael's Furniture Warehouse in the San Fernando & Los Angeles area. Product availability may vary. Contact us for the most current availability on this product.